The influence of the owner is crucial to every superyacht project, and that is doubly true in the case of Livingstone. 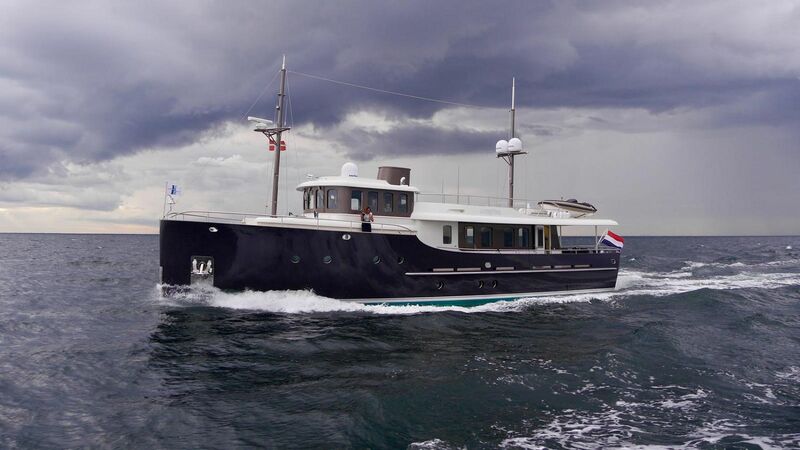 This 24 metre steel-hulled motor yacht simply wouldn’t be roaming Northern Europe and Scandinavia without her owner Johan Hartman, who not only financed the project, but also designed the 1930s inspired exterior (working in collaboration with Sheerline Yacht Design) and has captained Livingstone himself ever since her summer 2016 launch. A passionate yachtsman and commercial shipyard owner, Hartman has owned several yachts over the past two decades, but for this, his largest project to date and first for his own yard Hartman Yachts, he opted to do things a little differently. It is his experience running the Hartman Marine Group for the past 14 years that informed many of these technical decisions, which make Livingstone such an independent globetrotter. To a casual observer, her single 350hp MAN diesel set-up might seem curious, as it is the generally accepted wisdom that for long voyages there is safety in numbers when it comes to engines. However, Hartman argues that getting the secondary equipment (fuel storage, engine cooling etc.) up to a commercial standard is more important than adding a second engine, which drives up fuel consumption. For this reason, in addition to Livingstone’s 10,500 litre fuel reserve, she has also been fitted with a 700 litre day tank to reduce the chance of contamination and ensure an uninterrupted supply of fuel. This philosophy also informed the decision to install a freshwater intercooler. Despite this principled technical stance, Hartman acknowledges that not all yacht owners will agree with him and he is more than happy to build the next model in this potential semi-custom series with a pair of engines if required. Another personal decision that is easily reversible on hull number two is Hartman’s choice not to fit any crew cabins on Livingstone. A family man, he cruises with his wife and seven children on board whenever his main business permits. The Hartman’s family home is cited as the main inspiration for Livingstone’s surprisingly colourful interior décor. Marble worktops, leather inlaid woodwork and wooden shutters set the tone, but it is the pale blue velour armchairs and decorative mammoth tusks that really catch the eye. This theme is repeated in the master cabin, where Hartman has made good use of the yacht’s high freeboard to create more than three metres of headroom. The choice of a few bold items set against a neutral palette was informed by Hartman’s plans to spend weeks, even months on board at a time. “I’ve seen many yachts with ten different kinds of materials in one room and that’s what we tried to avoid because it’s nice for the first moment but after one month it’s too much,” he explains. Three further guest cabins provide accommodation for Hartman’s seven children, including a Pullman berth for the youngest, but the Livingstone platform has been designed with flexibility in mind and a wide range of layouts are available. This flexible mindset follows through to the cockpit, which is entirely kitted out with freestanding furniture, just like the saloon, and the open-plan upper deck, which carries Livingstone's 3.9 metre superyacht tender. Hartman has ambitions to build bigger, with 34 metre and 42 metre versions of Livingstone on the drawing board, as well as the more modern Amundsen design, and for this reason he is currently offering the original Livingstone for sale. After making her public debut at the HISWA In-Water Boat Show earlier this year, Livingstone will cruise south next summer with plans to exhibit her at the Cannes Yachting Festival, but even if a buyer is not found, Hartman is happy to continue on to one of his favourite cruising grounds, Croatia. “Our best moment on board was in Norway – in the evening, moored up in the bay with the sun going down and a little bit of fishing, that was the nicest experience. I’ve done that many times, sometimes the weather is a little bit worse than in the Mediterranean, but if you’re sailing through the fjords you don’t need nice weather” – a hardy mindset that the yacht’s Victorian explorer namesake David Livingstone certainly would have approved of.